Intel has revealed four new NUCs (Next Unit of Computing mini PCs) on its website, and these devices are powered by the company's new Skylake (sixth-generation) processors. Although strictly speaking, there are only two new models with two variations of each. First off we have the NUC6i5SY, which runs an Intel Core i5-6260U CPU (dual-core, 1.8GHz with turbo up to 2.9GHz) featuring integrated Iris Graphics 540, with the variations being the NUC6i5SYK and NUC6i5SYH – the former just has room for an M.2 SSD, and the latter is larger with extra space for a 2.5-inch SATA drive. 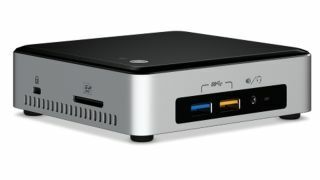 There's also the NUC6i3SY sporting a lesser Core i3-6100U (dual-core, 2.3GHz) with Intel HD Graphics 520, again with an identical choice of an SSD unit, or a larger box with space for a 2.5-inch drive. These new Skylake models can also take two sticks of DDR4 RAM up to a maximum of 32GB, and they offer Wi-Fi, a full-size HDMI port (allowing for 4K resolution), mini DisplayPort, four USB 3 ports (two on the front, two on the back), and an SDXC card slot. Pricing hasn't yet been announced and neither has the exact release date, but presumably these will be incoming pretty soon.